Tickets are now on sale for the ‘Emergency Ambulance Appeal’ raffle. The top prize is £300 cash, a £50 voucher for the OGH, Afternoon Tea for Two, at the Duke of Richmond, a luxury mirror and a bottle of champagne. Other prizes include flights to Gatwick, health club membership, vouchers and clothing. Tickets are £2 each and available at the following locations:- St John HQ, Les Cotils, Swarovski, the Mint Brasserie, RH Gaudion, Saumarez Park Tea Room, the St John HealthCare shop, Aladdin’s Cave, Bruce Russell and Allure Hair & Beauty. 1st Prize – £300 cash (donated by Skipton & Julius Baer), Simon Lovell mirror (worth £150), £50 voucher for the OGH Restaurant, Deluxe Afternoon Tea for 2 at the Duke of Richmond, a bottle of Rothschild Champagne. 2nd Prize – Aurigny return flights for 2 (Guernsey to Gatwick), £50 Batiff voucher, £50 Quay Gallery voucher, £40 De Nellos Restaurant voucher, Family ambulance subscription. 3rd Prize – One month membership for Kings Premier Health club, Kings Beauty 30 minutes back ritual, £30 Old Quarter Restaurant voucher, Case of Rocquettes Cider, Single ambulance subscription. 4th Prize – £100 Graham Scott & Co voucher, £30 Christies Restaurant voucher, Swarovski crystal set, Afternoon Tea for 2 at Les Cotils, Bouquet of Flowers from the Little Flower Company. 5th Prize – £50 Cobo Butcher voucher, £30 Village East Restaurant voucher, Item of clothing from Le Tricoteur, £20 Intersport voucher, a bottle of Prosecco. 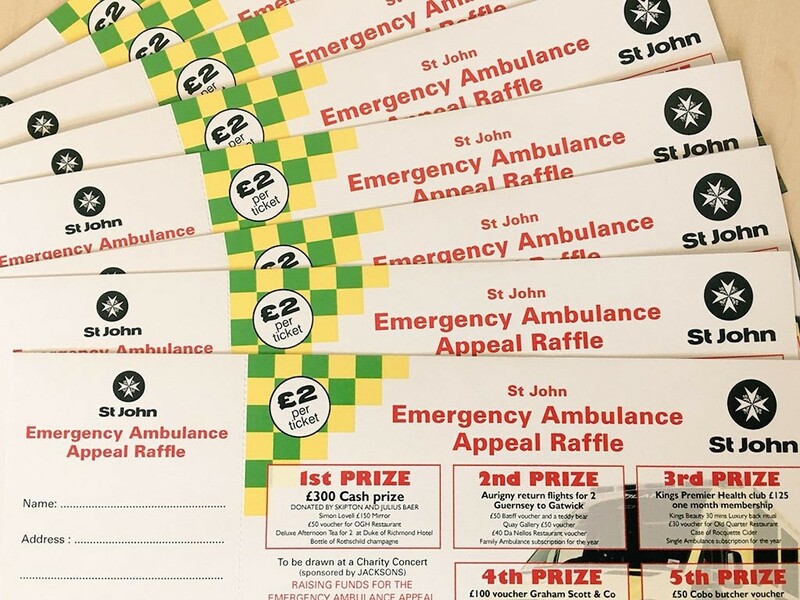 The draw for the raffle will be made at the big St John Emergency Ambulance Service Charity Concert at St James on Saturday 22nd September 2018. The concert features GU10, the Guernsey Welsh Male Voice Choir, Jump the Douit and Bel Canto. 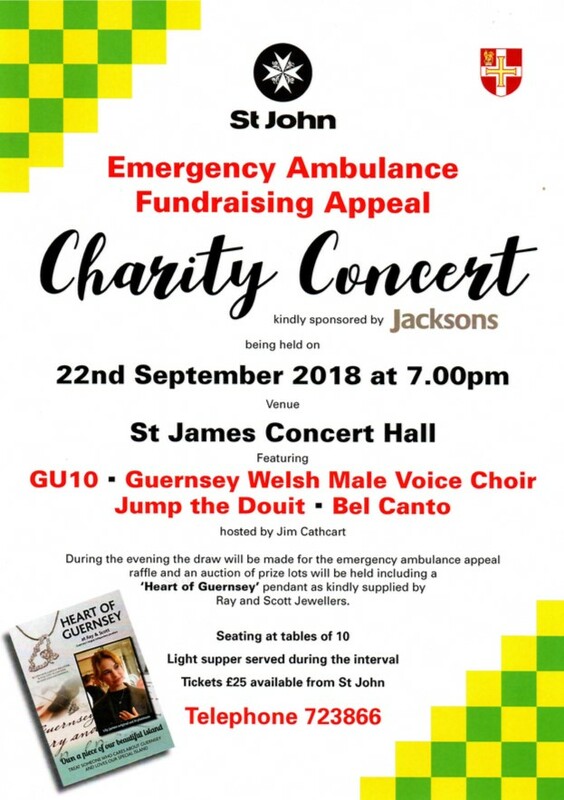 Money raised at the concert and from the raffle will go towards a new emergency road ambulance for the St John Emergency Ambulance Service. We’d like to thank all the local shops and companies that have supported the raffle and donated prizes.